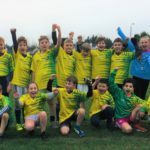 Congratulations to our Junior Gaelic Football teams who enjoyed a very successful outing away to Ashbourne Educate Together last Friday. 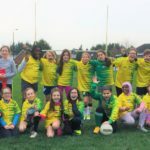 After receiving two months of excellent training from our 6th class coaches, Alicia, Ciara, Hollyann, Laura and Maria, this was the first chance for the 4th class players to represent the school and they performed brilliantly. It was also the first time that our teams got to wear the brilliant new kit kindly provided by Laura’s father Ben. Two friendly matches were played on the same day with boys and girls teams drawn from all 4th and 5th classes. Both teams performed very well with lots of great scores kicked and brave blocks made. We’re really looking forward to seeing more from this group in the future. RaLET Abú!